In just about any activity, we can get so caught up in following the rules that we miss the larger point. Sometimes we do that due to our own pride, our sense that we simply have to achieve perfection in order to be worthwhile. Of course, what we are really showing then is that we think that it is all about us and our ability to be right by our own standards. But when circumstances arise that make clear that it is not all about us and that we are not perfect, it can lay us low. That is exactly what happened to the rich man who encountered Jesus Christ in today’s gospel lesson. He was certainly not looking for someone to burst his bubble, for he had apparently convinced himself that he had fulfilled all God’s commandments since childhood. So the Lord opened his eyes to his true spiritual weakness. He told him to sell all his possessions, give the proceeds to the poor, and follow Him. That made the man very sad because he loved his money. It had probably never entered the man’s mind that he had a problem with loving his wealth too much. He had likely never thought that his riches posed any spiritual problems for him at all, for the conventional wisdom in that time and place was that riches were a sign of God’s favor. He was not aware that he was more attached to them than to God. But because of this hard teaching from the Lord, his eyes were opened a bit to his own imperfection, and he did not like what he saw. We need to hear this message from St. Paul because we have probably become comfortable and content with our present level of spiritual devotion and religious activity. Even when our minds are elsewhere, we may still say the words of our daily prayers, read the Scriptures, or attend services. We may fast, give to the Church and the needy, or prepare for Communion and Confession by simply going through the motions that have become so familiar to us over the years. We may even pat ourselves on the back for our piety and look down upon others whom we judge as godless. If we have come to think of our faith as simply a collection of habits that we repeat over and over in order to earn something from the Lord, then we have fallen into a spiritual fantasy, an illusion that has very little to do with God and everything to do with our pride. If that is the case, then we have too much in common with the man in today’s gospel reading who thought that he had mastered all the commandments. And like him, we need to be brought back to reality by a prophetic word that shocks us out of our complacency. This time of year, our wake-up call is the Nativity Fast. For if we are to become holy temples that are prepared to receive our Savior at His birth, we cannot remain captive to our illusions that we have achieved righteousness by simply doing this or that or having our names on the membership roll of our parish. Instead, we must know from the depths of our souls our complete reliance on the mercy and grace of our Savior, who came to call not the righteous, but sinners, to repentance. We must know our own sickness and weakness in order to receive the divine therapy that brings health and strength beyond our own ability. During this season of preparation to welcome our Lord at Christmas, we must embrace spiritual disciplines that help us know from our hearts why He became one of us for our salvation. Instead of mindlessly mouthing words or simply trying to make ourselves feel a certain way, we must persistently stand in the presence of God, with our souls fully open to Him, in daily prayer. We should concentrate our attention on the words of the prayers as a tool for being more fully present to Him. This will be a struggle, for there is much in all of us that does not want to be in personal communion with the Lord. And even as those who are not in good physical condition find it hard to exercise, we who are spiritually weak will have to struggle mightily in order to turn from our distractions and desires in order to give ourselves to Him each day in focused prayer. 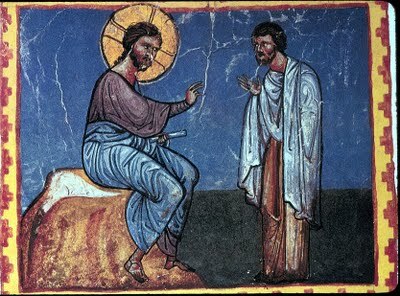 When we find our minds wandering or realize that we have forgotten to pray at the usual times, we should turn to the simple words of the Jesus Prayer: “Lord Jesus Christ, Son of God, have mercy on me, a sinner.” We are all able to focus our minds on those words as we open our hearts to the Lord in humility, even if only briefly. Praying in this way is far better than doing what the rich man did when he realized that he could not easily obey Christ’s command. He went away in sorrow; in other words, it appears that he just gave up. In contrast, we must never give up. When our eyes are opened to our own weakness and imperfection, we must channel our sense of guilt or failure toward true repentance, for humbly reorienting ourselves to the Savior. To do so, we must have the strength not to cave in to our prideful inclination to run away from disciplines that reveal our brokenness, that show us how imperfect we are. No, we must realize that it is not all about us or our success in doing anything. Remember St. Paul’s words: “For by grace you have been saved through faith; and this is not your own doing, it is the gift of God—not because of works, lest any man should boast.” Instead of running away due to hurt pride over our failures, we must learn from them the true nature of our spiritual state and use that awareness to open our hearts to the Lord as best we can with a humble plea for mercy. The same is true about giving generously of our resources and attention to the needy and lonely in Advent. The Lord gave no general command to sell all that we have and give it to the poor, but He certainly warned all against the grave spiritual dangers of loving money, hoarding our resources, and neglecting our hungry, sick, and poor neighbors. No matter how much or how little we have in terms of worldly goods, we all struggle with being as generous with our resources and attention as we should. All of us can find ways to put the needs of others before our own during this season, even if through very small acts of self-denial. Remember that the point is not to be perfect by our own prideful standards, but to manifest our Lord’s mercy as best we are able. And when we recognize how selfish we are before the unmet needs of others, that is a good time for the Jesus Prayer also. Instead of pretending that we are perfectly holy or turning away from Christ in sadness due to hurt pride, let us turn to Him in humble repentance, honestly recognizing our brokenness and imperfection, even as we trust in His grace. Let us embrace the disciplines of this season with joy, for they will give us the spiritual clarity to see that the Messiah born at Christmas comes to do for us what we could never do for ourselves. “For by grace you have been saved through faith; and this is not your own doing, it is the gift of God—not because of works, lest any man should boast.” Let us use this fast to prepare to receive our gracious Savior with the fear of God and faith and love.